2WAY-4851 , RADIO BATTERY FOR for Motorola NTN4851, NNTN 4496, NNTN 4497. 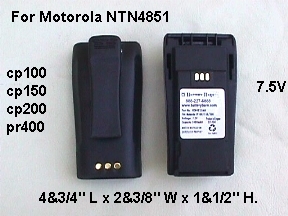 Home > * 2 Way Radio Battery > 2WAY-4851 , RADIO BATTERY FOR for Motorola NTN4851, NNTN 4496, NNTN 4497. A replacement battery for Motorola NTN4851, NNTN 4496, NNTN 4497. radio model number RADIUS CP100 , CP150, CP200, PR400 . We have two battery models -A standard Ni-Cad battery-2WAY-4851, or a Lithium Ion battery - 2WAY-4970LI. Please check your charger. If you have a Tri-chemistry charger (It can charge Ni-Cad, Ni-Mh or Lithium Ion batteries) ,than you can use either one of these batteries. If you have a standard charger or a Lithium Ion battery charger only. Please stay with the same chemistry battery as your original one. 2WAY-4851--- Ni-Cad battery, 7.5 V , 1200 mah. Dimensions at 4&3/4" L x 2&3/8" W x 1&1/2" H. The battery is brought to you by Battery Barn. 2WAY-4970LI--- Lithium Ion battery, 7.2 V , 1800 mah. Dimensions at 4&3/4" L x 2&3/8" W x 1&1/2" H. The battery is brought to you by Battery Barn.